Below is a collection of photos suitable for press use. Please be sure to use the attribution as shown in the description. Click on the photo to see & download the full size image. Caption: Washington’s troops cross the Delaware River. 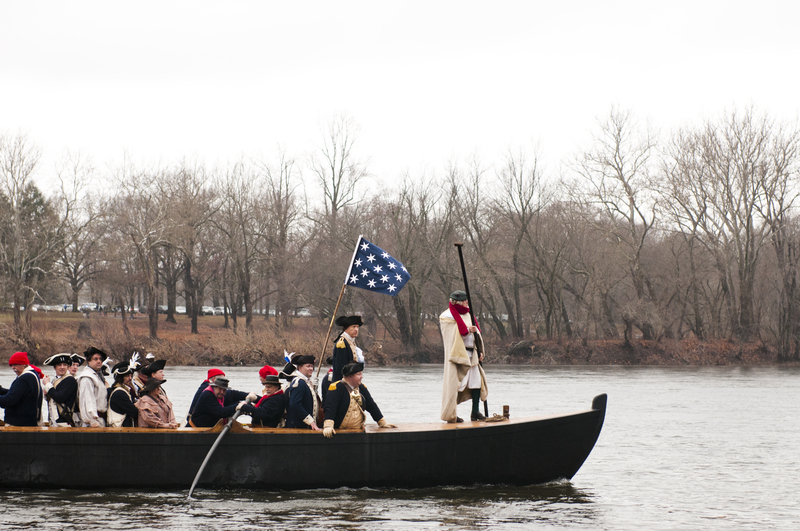 Caption: Washington Crosses the Delaware River in a reenactment every Christmas Day. Caption: Fort Nonsense provides a strategic lookout point for Washington’s army during the Morristown encampments. Caption: General John Cadwalader stayed in the Crosswicks Friends Meeting House before leading his troops westward to join other American forces in the second Battle of Trenton. Caption: General George Washington was headquartered at the Wallace house in Somerville during the Middlebrook Encampment of 1778-9. Caption: The First Presbyterian Church of Springfield was used as a storehouse during the American Revolution. The original structure was burned by the British during the Battle of Springfield. Its graveyard is the final resting place of at least 30 Revolutionary War soldiers. Caption: Reenactors take aim during the Battle of Trenton. Caption: Fort Lee Historic Park stands at the site of a fort abandoned by Washington’s troops in November 1776. Caption: Sandy Hook Light and the peninsula it stands on were British strongholds during the American Revolution. Caption: Merchant Cornelius Low’s Raritan Landing home was spared by the British due to his loyalty to King George III. Caption: Built in 1715, the Woodbury Friends Meeting House was occupied by both American and Hessian troops before and after the Battle of Red Bank in 1777. Caption: Built in the mid-18th century, the Cannon Ball House is one of the few witness buildings to survive the Battle of Springfield. Caption: People of all ages become part of the excitement at the Crossroads of the American Revolution. Caption: The Jacob Ford Mansion was Washington’s headquarters during the 1779-1780 winter encampment at Morristown, NJ. Caption: The Vought house in Clinton was one of many that the Patriot New Jersey Legislature confiscated from Loyalist owners during the American Revolution. Caption: The Covenhoven house was headquarters for British General Sir Henry Clinton before the Battle of Monmouth in 1778. Caption: The Van Veighten House was headquarters to Patriot General Nathanial Greene during the 1779 Middlebrook encampment. Caption: Caldwell Parsonage was the site of the shooting of Hannah Caldwell, wife of Rev. James Caldwell, during the Battle of Connecticut Farms, June 7, 1780. Her death became a rallying point for New Jersey Patriots during the Battle of Springfield and beyond. Caption: Troops reenact the Battle of Trenton on the site where it occurred in December 1776. Caption: Over 10,000 Continental soldiers built and lived in huts like these during the brutal winter encampment of 1779-1780 at Jockey Hollow in Morristown, NJ. Caption: The Abraham Staats house in Bound Brook was the headquarters of General Friedrich von Steuben during the second Middlebrook Encampment in 1779. Caption: The Nathanial Drake house was the site of a council of war held by General George Washington before the nearby Battle of the Short Hills in 1777. Caption: Loyalist Rev. Jonathan Odell was minister at Burlington’s St. Mary’s Episcopal Church. He fled to New York in 1777 following demands from New Jersey’s Provincial Congress to sign a parole agreement. He later settled in Canada with other Loyalists.